Last week I was watching the Xfactor and I noticed that Dannii Minougue had some fab bright red tomato nails. I saw them and thought they looked great and decided that I was going to paint my nails a similar colour using one of my all time favourite polishes. 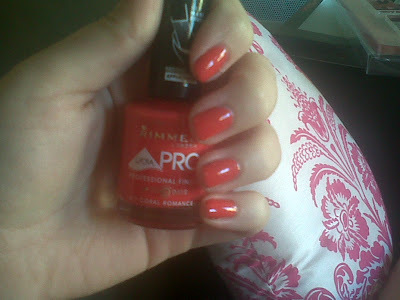 This colour is Coral Romance by Rimmel. I’ve had this colour quite a while now and every time I put it on my nails, I realise just how much I love it. Now one of the best things about this polish is the brush! It has a maxi brush which coats the whole nail in one go, which is amazing. I’m a pretty messy nail painter but with this brush its practically impossible to make mistakes which is a godsend for me lol. The colour is glossy and it pretty much lasts a week without any chips. The colour is almost perfect match to the one Dannii was wearing so I’m very happy with that. Also with the sunshine lately my bright nails fit perfectly with this sunny weather.